There are 3 falls that can be seen from roads. Abrams Fall has the largest water volume of all the park's fall. Abrams Falls is a 5-mile roundtrip hike. The trail begins in the back of Cades Cove loop road and is a moderate hike. Since the departure point for this hike lies within Cades Cove (the most visited spot within the Park), you will find it very crowded and hard to find a parking place to start your hike, unless you are hiking very early in the morning. You will climb to approximately 1,800 feet at one point, but when you arrive at the falls you are actually 300 feet lower than when you started. Grotto Falls trail begins at stop #5 on Roaring Fork Motor Nature Trail. This easy 2.5 mile roundtrip trail, through a hemlock forest, crosses 3 small streams and leads behind the falls. This is the only fall in the park that you can walk behind. Indian Creek Falls is a 1.5 mile roundtrip hike out of the Deep Creek Area. Along the route is Toms Branch Falls, and Juneywhank Fall. This is a short and relatively flat hike. Well worth the drive to Bryson City, just west of Cherokee N.C. If you are adventurous you can try tubing down Deep Creek. Great place to relax and eat lunch and cool off your tired feet. The water has always been too cold for me. Let my wife and daughter plunge in. I will stay in the background taking pictures. Laurel Falls is the easiest waterfall hike on the Tennessee side of the park. It is 2.5 miles roundtrip, and follows a paved trail. The trail cuts through the middle of a series of cascades. Laurel Falls is 60 feet high. 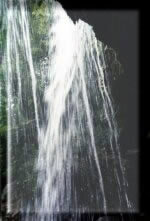 Mingo Falls can be reached by following the Pigeon Creek Trail out of Mingo Falls Campground. It is a easy 1/2 mile roundtrip hike, a longer side trails branches off at the halfway point and will take you to the top of the falls. Mingo Falls has a spectacular drop of about 200 feet. Ramsay Cascades is the highest waterfall in the Park. The trail leads through a rich hardwood forest. It is a strenuous 8-mile roundtrip hike. The trailhead begins in the Greenbrier Area. This is not a complete list of all the waterfalls in the park. There are plenty of other well known and lesser known waterfalls, such as Cataract Falls just 1/2 mile behind the Park Headquarters Building. Ask a ranger for details and enjoy exploring. Bridal Veil Falls - This waterfall cascades over U.S. 64 just west of Highlands. You can drive your car behind the veil of the falls.